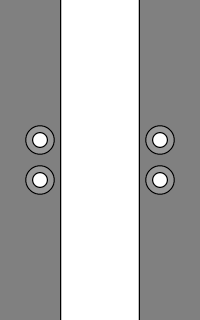 • Begin straight across on the outside (grey section) and in through the bottom eyelets. 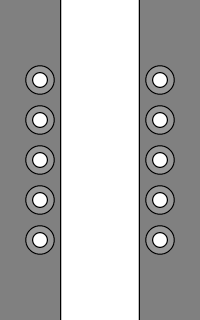 • At each eyelet pair, cross the ends, feeding in through the next higher set of eyelets. Repeat until lacing is completed. • At the top, the ends remain hidden inside the shoe. 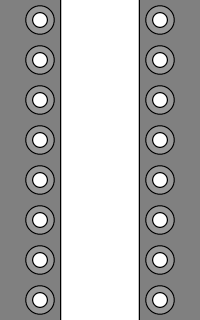 This lacing is sometimes referred to as "Canadian Lacing", based on its use by some Canadian ice hockey players, who believe that it creates a tighter fit for ice skates. In this case, the laces would obviously be tied across the top (rather than tucked in). This comes at the expense of being more difficult to tighten because it's harder to get fingers under the laces from the bottom of the shoe and pull up. On the flip side, this lacing can be loosened more easily because it's easier to get fingers under the laces from the top of the shoe and pull down. Nike Blazer Highs with Display Shoe Lacing. "In most shoe stores, the shoes come pre-laced from the manufacturer, either with "Shoe Shop" lacing or "Display Shoe" lacing, depending on the type of shoe. The shop assistant rarely laces new shoes at all, except in the cases where the store has a policy of relacing shoes to make them easier for customers to try on (usually with Straight (European) Lacing or Criss-Cross Lacing)." If you'd like to send feedback about Display Shoe Lacing, please Contact Ian. 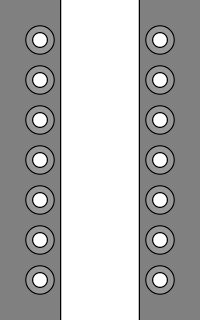 Almost identical lacing used on combat boots by the Canadian Armed Forces. 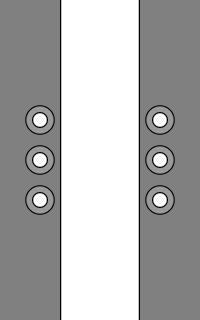 Inside-out version, with ends emerging from eyelets and knotted across top. 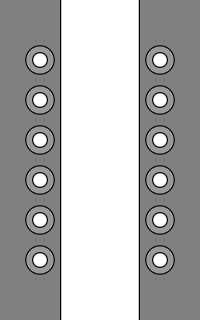 The bottom section of Chevron Lacing is identical to Display Shoe Lacing. 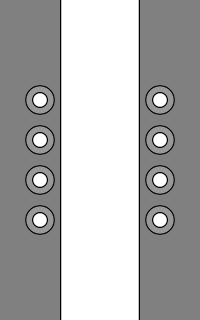 View and customize Display Shoe Lacing using Create-a-Lace.